Start and finish of the swimming stage are located on the beach Sports and Recreation Centre next to “Lake Horse” in Przechlewo. Start will be approximately 50 meters from the shoreline. Entrance to the water is soft and sandy. Competitors will have one loop depending on the distance. After the start competitors will be guided along the designated route – marked by highly visible buoys. Each buoy must be passed on the right hand side. Buoys differing in color to the other marker buoys will mark the start and finish. In the middle of the route has been designated a special zone for rescuers WOPR and judges. Upon exiting the water athletes will be assisted by volunteers who will assist them to exit the water efficiently. The distance from the water to the zone change is approx. 300 meters. Competitors will run out of water in the direction of reception (light ascent) to after crossing a gate they will reach the center ofof the transition zone. Competitors will run to the transition zone along a designated route of the grass surface and the concrete spread with carpets and rubber mats. 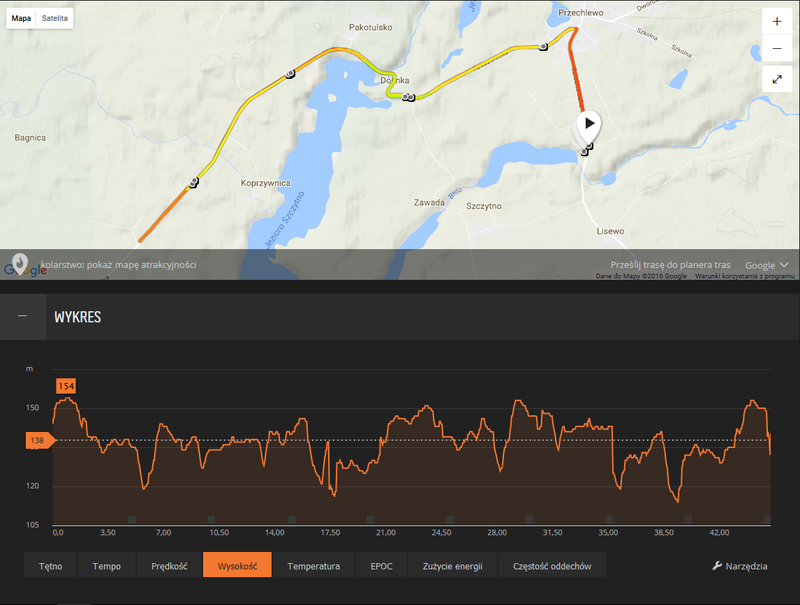 All distances were measured using a GPS system. time out of completion swim 90 minutes. Start and finish the stage cycling are located opposite the reception desk Sports and Recreation Centre on Lake Horse in Przechlewo. The entire route will take place on an asphalted surface. From the start competitors will head towards the centre of the town where upon at (the Cooperative Bank, near the Police Station) they will turn left towards Rzeczenicy. The rest of the track is situated between Osir and Rzeczenica Competitors will complete the appropriate number of loops. In the middle of the loop (town of Dolinka) players will have to tackle a decent and ascent (first clockwise, then anti-clockwise) exit in the direction of the Brda River. After the bridge across the river to there is steep and long ascent in the direction of Pakotulsko. The road to Rzeczenicy is flat with gentle descents and climbs. One ascent before Rzeczenica on the road, a second ascent in the roadway before descending down to the transition zone. After the completion of the right amount of loops competitors will be guided back to the Sports and Recreation Centre in Przechlewo where they will cross the finish line. Where rubber mats and carpets will be spread on the ground. All distances measured using STS Timing.pl. For all distances Competitors have to complete the run-loop cross-country (400m) and the roll-out of cross-country loop to the finish stage (210m). Start and finish the running stage is located in the Sports and Recreation Centre next to Lake Horse in Przechlewo. Players run out of the Transition Zone in the direction of walking/bike paths, which start outside Sport and Recreation Centre towards Kleśnik. 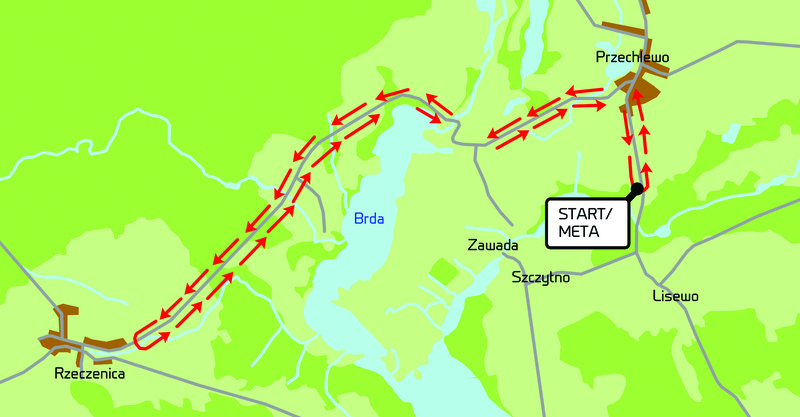 Immediately after running along the path, they will cross the River Brda bridge and turn left. The route then leads along an asphalt road (approx. 500m), then onto a paved road followed by a road with block paving – ascending to a junction with the road to Szczytno (approx. 400m). After this there will be a right hand turn in the direction of Szczytno, this is a route with a block paving surface (approx. 2.5 km). 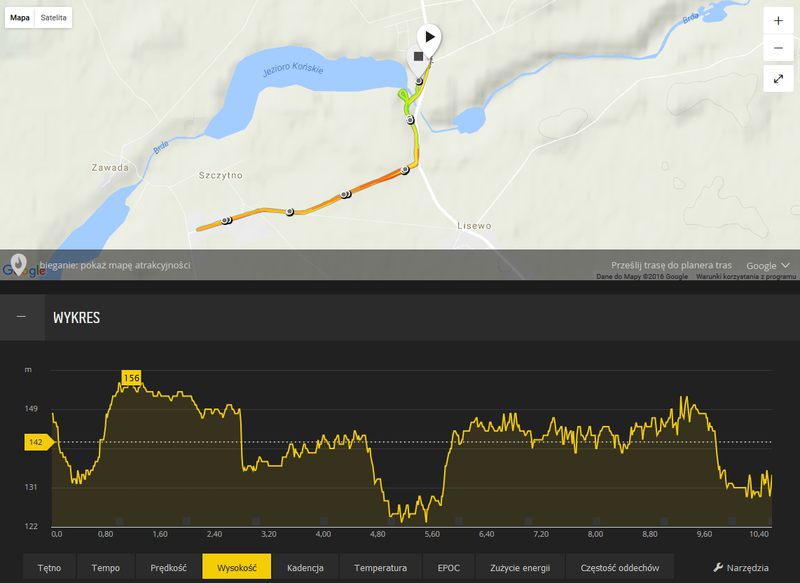 They will run into the town of Szczytno (asphalt road), run through the whole town, do U turn and head in the direction of Sports and Recreation Centre in Przechlewo. Here the transition zone will be located distance 56.5 km and 112, 99 km, after which the competitors run for another loop. Where indicated there will be rubber mats and carpets. The distance was measured using a GPS navigation system.